A home or business owner wants a new bathroom where none exists. So he or she asks you for an inspection, an assessment and a quote. The space happens to be in a basement, on a slab or in a garage. In any event, to create below-floor drainage with either conventional plumbing or sewage ejection, you immediately conclude that you must pound through concrete. That means a messy, noisy, time-consuming job — and a high cost. So high, in fact, that when your customer sees your estimate, chances are, he’ll tell you to forget it. As a professional plumber, you may regard digging through concrete as simply one of the hazards of your trade — an everyday part of making a living in the business. If a customer doesn’t want to deal with the hassles, that’s fine: You just move on to the next job. While we can admire your toughness, we cannot endorse your logic. For most plumbers in situations like this, cutting through concrete is simply a bad idea whose time has long gone. Of course, we sell above-floor, macerating and grinder plumbing systems for a living. As a result, we are true believers in the performance, convenience and cost-saving benefits of this technology, which was successfully developed a half century ago in Europe, but is still relatively new to the U.S. market. Unfortunately, when confronted with the above scenario, too many American plumbers fail to consider the above-floor option, probably because they haven’t yet tried it. But even if you don’t know much about my product, we would urge you not to discount the pitfalls of busting through concrete floors in a home. There are some truly sobering hazards to ponder before subjecting your customer to them. The remainder of this article will enumerate the most important of those hazards. Before you proceed on your next floor-busting project, you may want to sit down with your customer to discuss each of these potential problems in depth… on your way to considering an alternative approach. Cutting concrete undermines structural integrity: Any time you cut into a slab, you decrease the foundational integrity of the building — no matter how close to a perfect cut you make. You may be able to be able to patch the hole you create well enough to eliminate any aesthetic objections from your customer. But is that floor as solid as it was before you began to cut? I would bet not — especially if you fail to use the same or a better grade of concrete. And if the home sits on ground that’s less than solid, such as sand, it may begin to settle differently after the cut. In a multi-floor building, cutting into a slab on the second, third, fourth levels to run plumbing beneath the floor would be a huge no-no. That’s why commercial renovation projects that require additional plumbing will typically use external soil stacks, putting the external plumbing tree on the outside of the building. Well, if you shouldn’t cut into any of the upper levels of a building, why would you think you could safely cut into the first-level — the slab on which everything else sits? Cutting concrete is unpredictable: Installers don’t always know the depth of the concrete, whether it sits on rocks or a ledge, or whether it contains rebar or tension cables. You can cause major damage if you accidentally cut one of those cables. Professional contractors understand this hazard and never begin cutting without first using an x-ray machine to determine the positioning of the cables. But even then, the slab was most likely designed to use a certain number of cables with a certain amount of concrete. If you begin removing chunks of concrete, those tension wires may begin pulling in a different direction, creating integrity problems and causing delays and extra expense. Cutting concrete is seldom, if ever, perfect: I may try as hard as I can to cut a perfect circle, square or rectangle into a floor for burying a sewage ejector and its waste-storage basin — but no way. That “perfect” shape will inevitably crack on the edges and fray outward in unintended directions, often well beyond the hole I am digging. And once a stress crack is created, how far down does it extend into the footing or into the walls? 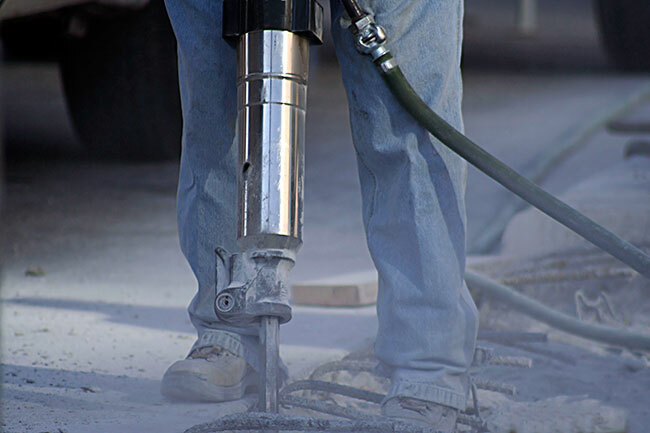 Cutting concrete creates leaks and seepage: Once a stress crack is generated, radon and ground-water penetration is a major issue, with the latter bringing unwanted moisture and mold problems as well. You don’t need a major flood to trigger these hazards. A higher-than-usual water table because of extended wet weather, such as in the spring, could be the culprit. Even if the cracks and seepage are not large enough to jeopardize the foundation, enough wetness could infiltrate to ruin walls, floors and furnishings in a finished living area — including that beautiful new bathroom that necessitated digging through the concrete in the first place. 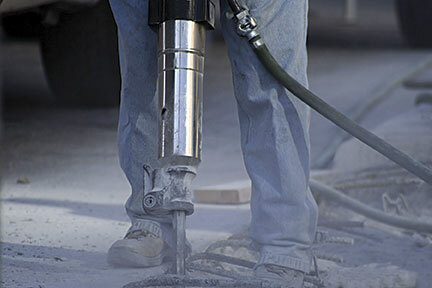 Dust, dust and more dust: Breaking through concrete generates an extraordinary amount of noise and dust. Happily, the noise stops when the jackhammers and saws shut down, and your workers finish their backbreaking job of hauling concrete chunks off the premises. But the dust doesn’t fade nearly so quickly. That’s because it is not conventional household dust, but a thick particulate that inevitably gets into everything, including the central air system, which means it can be around for a long time if not properly handled. I have heard of homeowners finding pockets of concrete dust years after a project finished. Obviously, this dust is not something a homeowner will want her family breathing for any length of time. (You might think the same for your own crews.) Anyone contemplating this type of work must seriously consider what sort of air-purification process is needed to remove all the dust from the premises. Cost factors: Last, but certainly not least, there’s the problem we mentioned at the outset of this article, the one that often proves to be the biggest deal-breaker of all: cost. The actual expense of cutting concrete depends on the size and complexity of the job, as well as local labor availability and rates. In some parts of the nation, the per-foot rate may be a few hundred dollars; in others, $1,000 or more. Seeing these costs, some plumbers outsource the work and are content to make little or no markup on their sub’s charges. Others, preferring to keep the job in house, absorb the time and cost of renting the cutting and hammering tools and lugging them on and off the job site; or, if they choose to buy, the cost of maintaining and replacing these tools, as well as depreciation. Perhaps the biggest and most painful expense of all is the “lost-opportunity” cost. With above-floor plumbing, creating a new bathroom where none exists usually takes a day, maybe two at most, to install the basic plumbing. Go the busting-through-concrete route and you’ll be on the job triple or quadruple that amount of time and likely more. What other work could you be doing all those extra days — more profitable work that you like much better and are really good at — instead of wrestling with broken concrete and all the hassles it brings? So the next time you have the “opportunity” to bust through a concrete floor to run piping or bury an ejector pump, we hope you’ll take a few minutes to recall all the red flags we have raised in this article. Why keep doing things The Old School Way when there’s an easier and less expensive alternative that will leave your customer happier and your bank account fuller? Chris Peterson serves as West Coast regional sales manager for SFA Saniflo. He can be reached at cpeterson@saniflo.com. Bill Hicks is president of JNJ Sales in Kenmore, Wash. He can be reached at JNJSALES@comcast.net. SFA SANIFLO U.S.A. — whose parent company originated macerating plumbing technology — offers a complete line of up flush toilets and gray water pumping systems for residential and commercial applications. Saniflo developed its innovative, “above-floor plumbing” technology more than a half-century ago and has led its commercialization worldwide. Today, the company markets macerating technology through 14 subsidiaries in 50 countries and has sold more than six million units worldwide since 1958. Saniflo markets through independent sales agents throughout North America, and the product line is currently available at distributor and dealer locations throughout the United States and Canada. For editorial assistance, including photography, contact John O’Reilly c/o GreenHouse Digital + PR: 815-469-9100 or john@greenhousedigitalpr.com; or visit: http://saniflo.greenhousedigitalpr.com/archive/.